Thirteen artists consider the book. 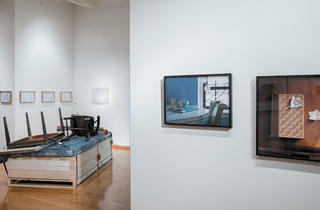 Photograph: John R. Boehm Installation view of "Structures for Reading" at the Center for Book and Paper Arts, Columbia College, 2013, showing works by Sebura & Gartelmann, left, and Liz Sales. It looks as though Photography and the Art of Seeing, the closed library book in Liz Sales’s photograph steam (2010), is overdue. Someone has perched a mug of tea on one corner, and two miniature trees sprout from heaps of dirt atop the book’s cover. 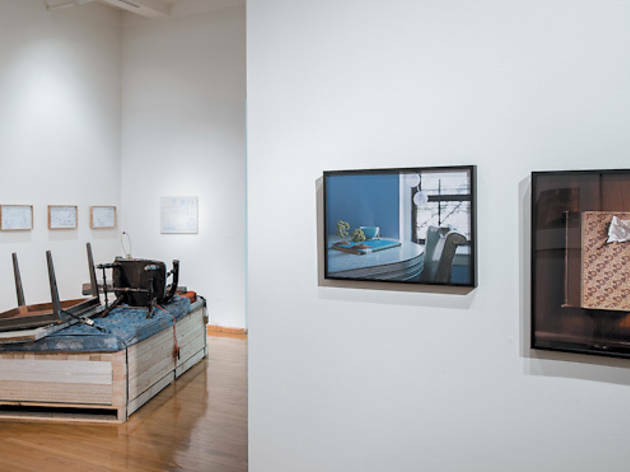 While the surreal steam depicts neglected printed matter, most of the 13 artists in “Structures for Reading: Text & the Reading Body in Contemporary Art,” which is curated by Jessica Cochran, defiantly link reading to physical artifacts. Sebastian Schmieg and Silvio Lorusso’s print-on-demand book 56 Broken Kindle Screens (2012) drags even the e-book out of the virtual world, compiling photographs of smashed Amazon readers that display surprisingly poetic glitches. Other pieces render fictional narratives real. Sebura & Gartelmann draw the floor plans of apartments described in their favorite books, then compress the spaces’ shabby furniture and other accoutrements into the sculpture Palletized Material for the Construction of a Space Based on the Writings of E. Annie Proulx, Charles Bukowski, Raymond Carver and Cormac McCarthy (2013). New York–based Gareth Long collaborates with Sebura & Gartelmann and another local duo, Dilettante Studios’ John Preus and Will FitzPatrick, on his ongoing sculpture series Bouvard and Pécuchet’s Invented Desk for Copying, which is based on an unfinished Gustave Flaubert novel. Each team presents a version of this desk shaped by their interests, prompting us to consider our own negotiations among the texts we read, our imaginations and actual space. “Structures for Reading” occasionally grows too opaque. However, most of its artists excel at engaging viewers—especially Eva Kotátková, whose House Arrest (2009), an amusing photo of the artist hemmed in by her books, may inspire some e-reader purchases after all.